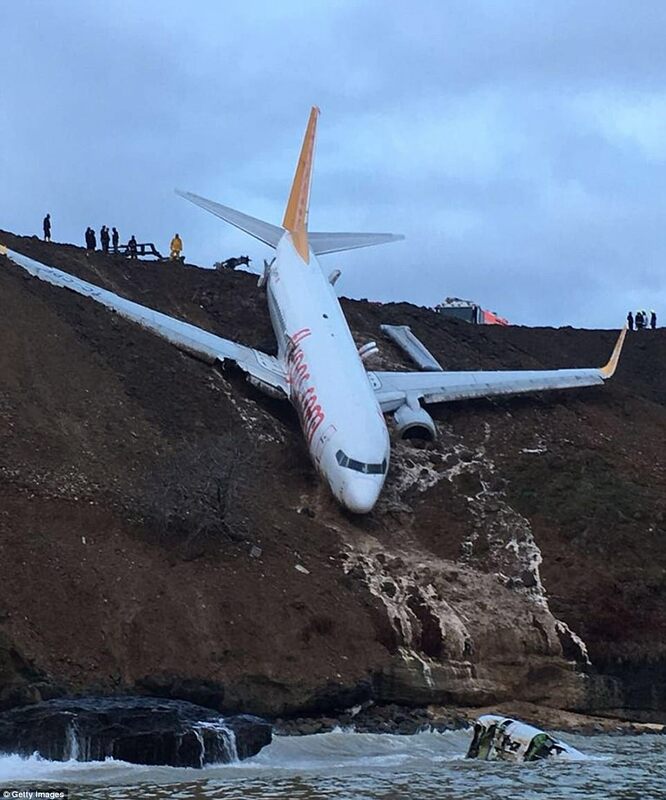 A passenger jet carrying 168 people came within metres of plunging into the sea after it skidded off an icy runway as it landed at a Turkish airport. 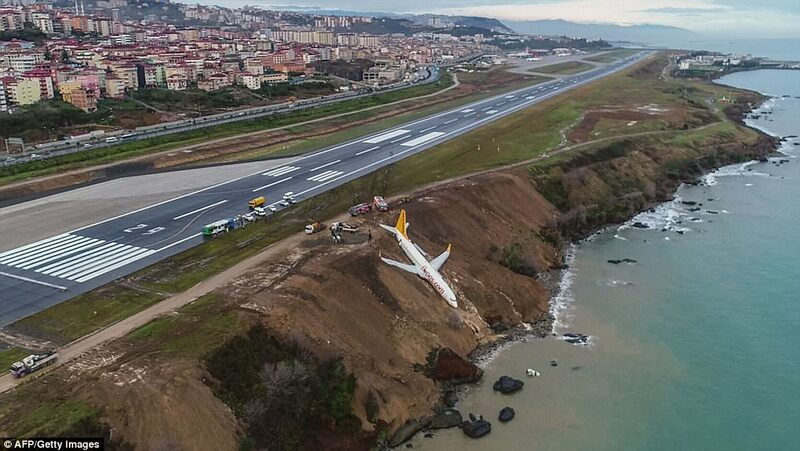 Panic spread through the Boeing 737-800 as it stopped at the edge of the Black Sea - with its nose dangling precariously off a cliff edge. 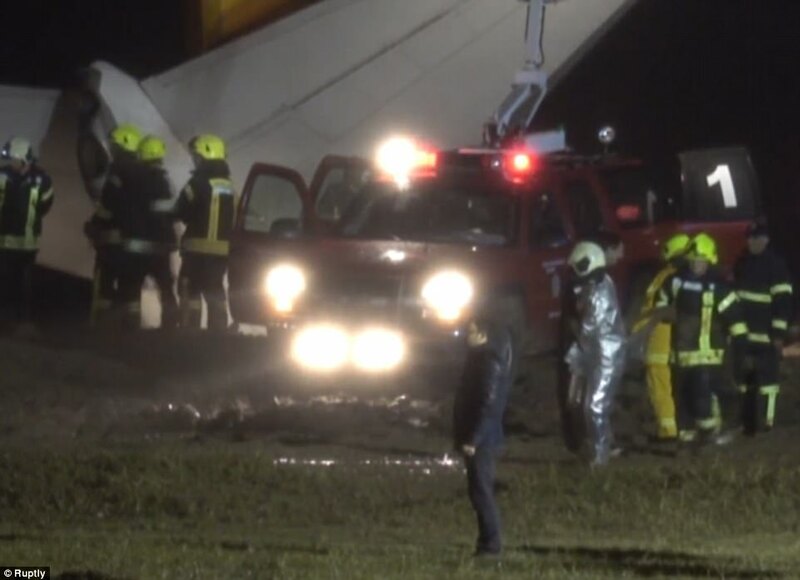 Luckily, flight PC8622's wheels became stuck in icy mud as it left the runway at Trabzon Airport, which may have preventing it from entering the sea. 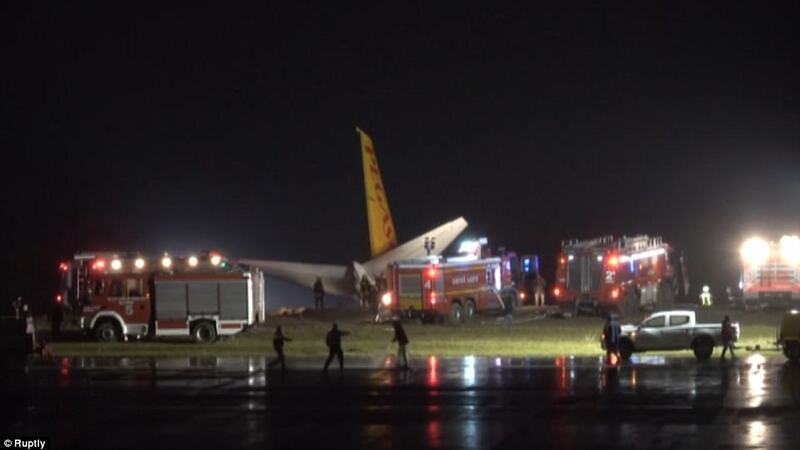 Pegasus Airlines confirmed in a statement there were no injuries among the 162 passengers onboard as well as two pilots and four cabin crew after they were evacuated. Shocking footage from inside the Pegasus plane taken just moments after the crash shows passengers evacuating as women and children are heard crying out in fear. 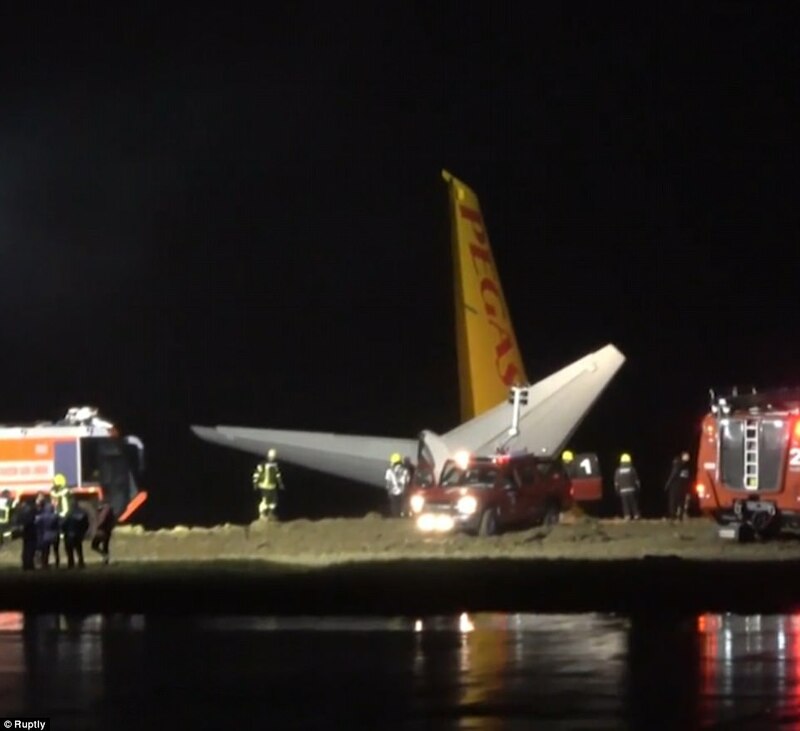 The aircraft's left jet engine was also ripped from its wing during the crash. Bodies fill the central aisle of the aircraft and stewards can are heard addressing passengers over a loud speaker system. The dramatic footage appears to show smoke billowing from the cabin. Another clip taken from outside the aircraft shows fire services dousing the plane with jets of water. However, from the video there is no suggestion of there havingbeen a fire. More footage shows passengers gathering under the wing of the plane on the steep slope down to the water. The flight departed from Ankara, Turkey's capital, on Saturday evening. 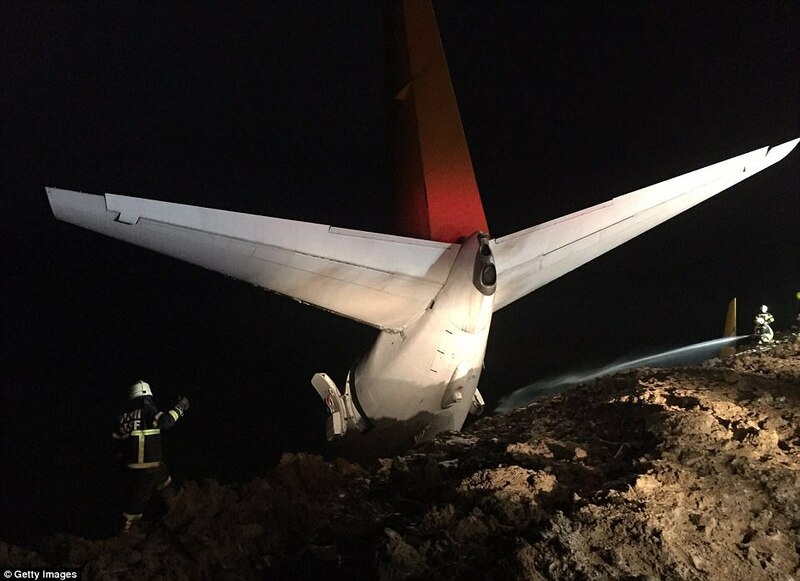 But on landing at Trabzon Airport, just under 90 minutes later, the plane left the runway. Pegasus Airlines is a Turkish budget airline based in the Kurtköy area of Pendik, Istanbul. One of the passengers, Fatma Gordu, said panic erupted onboard during the landing. 'We tilted to the side, the front was down while the plane's rear was up. There was panic. People shouting, screaming,' she told state-run news agency Anadolu. 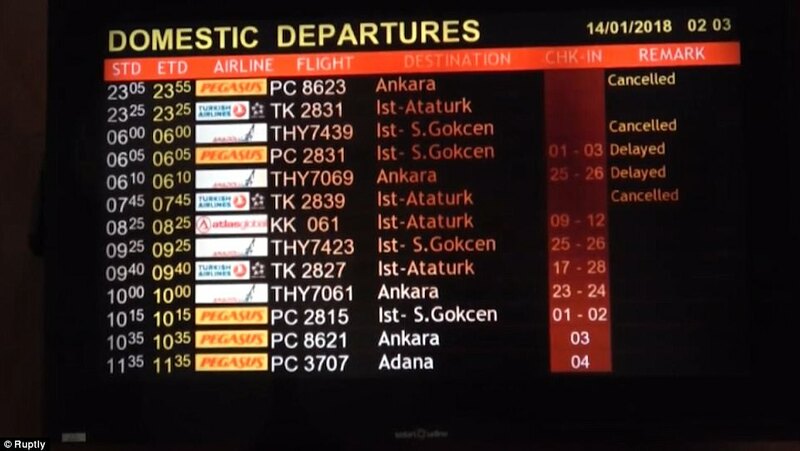 Trabzon Airport shut and flights were delayed and cancelled as passengers from the flight were evacuated. 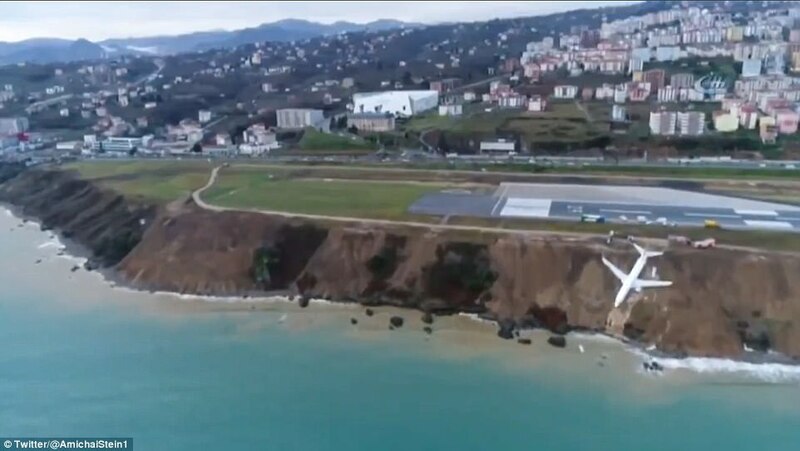 Trabzon governor Yucel Yavuz confirmed that all of the passengers and crew on board escaped uninjured, saying: 'We've taken all necessary measures. We will reopen the airport to air traffic as soon as possible'. He added that a crisis desk had been set up at the airport. Flights have now resumed in and out of Trabzon.